La Vie Est Belle will be open this Friday from 5:00 pm to 8:00 pm for the First Friday Art Walk! La Vie Est Belle will be featuring their One Eye Love Collection. 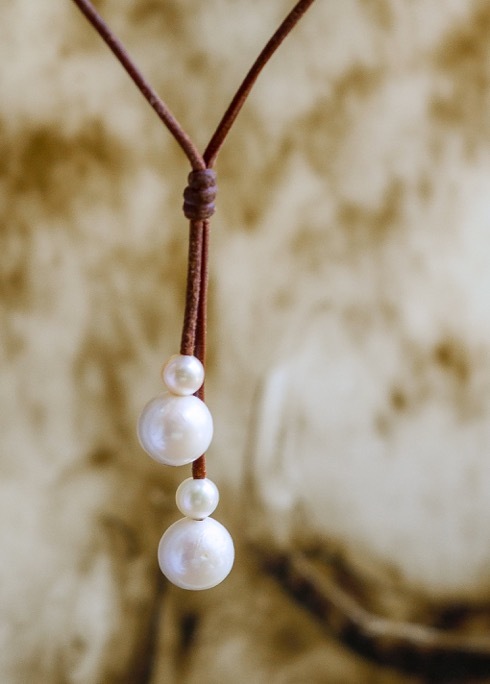 The One Eye Love Collection is a collaboration of pearls and leather created & designed, together by Wendy Mignot and Laura Bailey. Laura is a 20+ year yoga warrior with a studio along the Emerald Coast in Santa Rosa Beach, FL. Wendy and Laura’s friendship has blossomed in to an amazing line of jewelry that reflects love, wisdom, spirituality, friendship and family. Each piece is intricately made with creativity and full of beautiful energy. Big Party on Friday at La Vie Est Belle! We are having a big party March 3rd for our First Friday Artwalk launching a new collection of jewelry by Violet, Zak, and Cheyenne Mignot. We are also showcasing “Feathers For The Future”, Violet Mignot’s senior capstone project. It’s going to be a lot of fun! Join us on Friday night! Wendy Mignot’s studio La Vie Est Belle will be open for the First Friday Artwalk on Friday, December 2. Open all day from 10am to 6pm. Artist Wendy Mignot November Events! We will be hosting a wine tasting on November 4th featuring Seaside Wines and artist, Wendy Mignot at La Vie Est Belle in Seaside, FL. Annual Black Friday and Small Business Saturday events with specials and discounts all throughout Thanksgiving weekend! November 25th-27th. Special Necklace for Breast Cancer Awareness Month! The name of the necklace is the Pink TaTa Necklace with 100% of profits to be donated to Wendy Mignot’s hometown breast cancer research organization, Seymour Pink. The price is $100. It will be available all month at La Vie Est Belle and on www.wendymignot.com.